Pradhan Mantri Ujjawala Yojana: Government Completed Target Of 5 Crores Free LPG Connections! 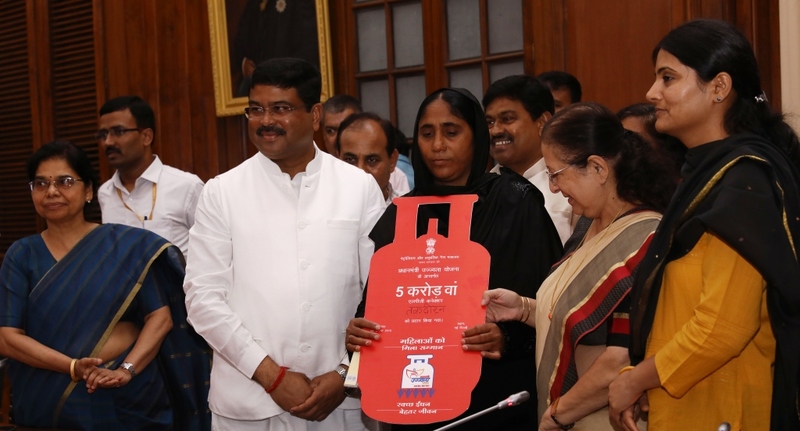 On the day of 3rd August, the government achieved its target of providing 5 crores free LPG connections. The government completed its target 8 months before the scheduled date. The target was supposed to be achieved within 35 months but it got completed in 27 months. This great news symbolizes India’s development and the government’s sincerity to complete its promises. The last free LPG connection was given to a lady living in Delhi, at Sangam Nagar vihar, Takridiran who belongs to Muslim community. Lok Sabha Speaker, Sumitra Mahajan has herself handed over the papers to her. Under the ‘Pradhan Mantri Ujjawala Yojana’, the Government promised to give 5 crores free LPG connections to the people who can not afford it. The Pradhan Mantri Ujjawala Yojana was started on 1st May 2016 with the promise of providing 5 crores free LPG connections within 35 months. That means the expected date for completing the target was March 2019. But the government was successful in achieving its goal 8 months prior to its promised date. Pradhan also said that the government will be providing 3 crores of additional free LPG connections near 2020. The news is great for the poor families that are unable to buy the gas connection for cooking food on their own. This kind of news gives us hope that India is developing and the politicians are actually taking steps towards the betterment of its people. Most poor people in India were cooking their food on ‘Chulha’ using wood or cow dung. This was harmful to the women cooking food and also the smoke coming from it used to bother the members a lot. They also had to work a lot more to collect firewood as a fuel for their ‘Chulhas’. But now with the help of government, they will be having a good and easy time cooking food. Most numbers of free subsidies were provided in Uttar Pradesh that is 87 Lakhs, then in West Bengal-67 lakhs, Bihar-61 lakhs, Madhya Pradesh-45 lakhs, Rajasthan-37 lakhs, Orissa-30 lakhs.